The Lumia 950 comes in a quite big paper box, but covers just the basics - you get a 1.5A USB Type-C charger with a cable, and a separate USB Type-C cable. Some retailers are throwing the Microsoft's Display Dock worth €109 with the pre-orders, which is needed for Continuum to work. There are no headphones bundled with the Lumia 950. Microsoft Lumia 950 spreads at 145 x 73.2 x 8.2 mm and weighs 150 g. That's about the same as an Xperia Z5, just a millimeter thicker. You would need an Adobe Flash-capable web browser to visualize the interactive 360-degree view above. Microsoft took the safest approach with the Lumia 950 series, and particularly the Lumia 950 - it went for a familiar, clean and durable design in favor of trendy looks and shiny elements. The result is a grippy smartphone with pleasurable handling and modern business looks. It isn't a fashion accessory, but it's something many of us can appreciate. 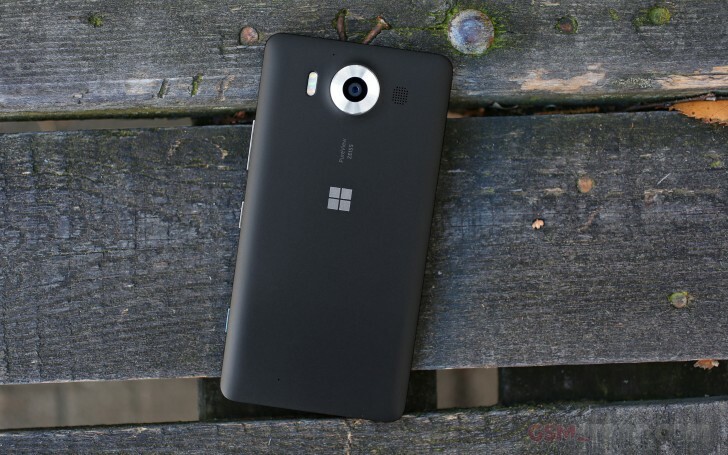 The Lumia 950 keeps some of the established Lumia traditions, but makes a departure from others. It is made entirely of durable matte plastic and the screen is protected by a perfectly flat Gorilla Glass. But the Lumia 950 now allows swapping the battery anytime, which is somewhat of a rarity among the older siblings. Handling the phone is nothing short of a pleasure, as the matte plastic provides excellent grip. The 5.2" screen isn't considered big anymore and the Lumia 950 is in fact quite comfy for one-handed operations. We had no problems using the phone - even with just one hand, even when shooting images and videos, and we didn't feel afraid we'd drop it. Indeed - Lumia 950 usability level - just great. Finally, the Lumia 950 is of a great and sturdy build, a signature among the entire Lumia lineup, and we appreciate Microsoft keeping the build quality consistent through the years. While the primary mic is the only thing of interest below the 5.2"AMOLED screen, above is pretty crowded. At first the earpiece and the 5MP selfie shooters seem to be all of it, but further exploring reveals the almost invisible iris scanner next to the selfie snapper. A bunch of sensors are also hidden close to the earpiece, the second of four microphone is here too, while a special emitting red light thingy is at the far right. This red light works the same way the speed cameras do - it lights up and helps the iris sensor work no matter the conditions - your iris will be recognized even in pitch dark room. We'll talk about Windows Hello in a minute. There is nothing on the left, while the right side has the volume rocker, the power/lock key and the camera shutter. The top of the Lumia 950 houses the audio jack, while the bottom has the USB Type-C port. Finally, the clean back is not so clean after all. Here is the 20MP PureView camera with ZEISS optics, circled by a textured metallic piece. The loudspeaker grille and the tri-LED RGB flash are close by, as is the metal Windows logo used for wireless charging pin. The third and four microphones used for rich audio recording are also around. Popping the battery cover reveals the microSD slot, the SIM bed and the removable Li-Ion battery.